Exosomes are the smallest of the membrane bound vesicles that cells are known to shed. They are 30-100nm in diameter and partially overlap with microvesicles which are 100nm to 1000nm in size. Both groups of particles are biologically important. However their small size-especially for exosomes- makes them difficult to study with traditional light microscopes unless many are localized in a single area. While not every study distinguishes between these two classes of microvesicles, some of their cell signaling features do suggest a direct role in cancer metastasis. For example, they contain growth factors, mRNA, and miRNA; They have been shown to transfer onco-receptors to normal cells, promote angiogenesis, direct cancer growth, and make cancer worse. They also can be used to remove toxins from cells, and may serve as biomarkers themselves for disease states. Current techniques for separation and isolation of exosomes remains time consuming. These methods typically rely on overnight centrifugation, or on expensive affinity-capture techniques that can only target known proteins. Because there is a need for a reliable method to supply large volumes of exosomes for further study, the Gale group is developing methods and devices based on Field Flow Fractionation to address these and other technical aspects of exosome harvesting and isolation. 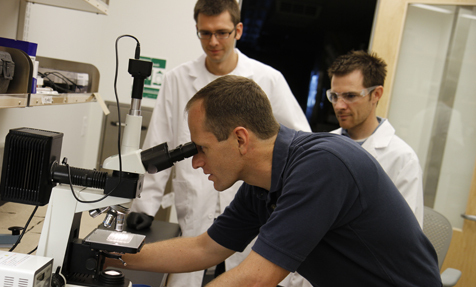 The goal of this research is to develop a device capable of continuously harvesting exosomes from a biological sample. Watch for updates on this and the Center’s many other research projects by clicking on the Research tab.